For over 25 years, across more than 30 countries, and for more than 1000 presentations, Petra Kolber has reigned as one of the foremost fitness authorities of our times. 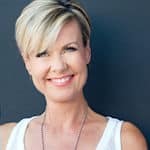 She choreographed and starred in over 100 award winning workouts (on television shows, DVDs, and good old-fashioned VHS) and has consulted for numerous leading companies, including California Walnuts, Reebok, Adidas, Gatorade, Acacia Media, Health Magazine, and Yes Fitness Music and has been featured with Dara Torres, George Foreman and Nancy Kerrigan. She has been the guest host for the online fitness and wellness show Daily Burn 365, 2016 Canadian Fitness Professionals International Presenter of the Year, 2016 Sara City Mania Female Presenter of the Year, One of America’s Top Female Trainers by Spry Living, One of Three Women Who Wow by Lee Jeans, Winner of The Fitness Inspiration Award by Health Magazine, Voted “Most Likely to Succeed” by The New York Times, Fitness Instructor of the Year by IDEA Health and Fitness Association, and Four-time Winner of The ECA Best Female Presenter of the Year Award. She revolutionized the fitness world by giving instructors the ability to control the tempo of their music (and the spring in students’ steps) directly from the palm of their hand, when she Co-Created the First-Ever Pitch Control App for the Smartphone. And now, she’s the proud author of the incredible book, The Perfection Detox, Tame Your Inner Critic, Live Bravely and Unleash Your Joy. Ready to take a Peek Inside the Book? Here’s the absolute truth: You deserve a life filled with joy, hope, and possibility. If you have picked up this book, you know deep down that you are yearning for this life yet to be lived, with fear diminished, anxiety and regret reduced, and optimism restored. My hope is that this book will be a resource that you come back to again and again. Whether you have a lazy afternoon (we can dream, right?) or just five minutes before an important meeting, this is your handbook for taming your inner critic, living bravely, and unleashing your joy. Have confidence in this process and trust the moments as they unfold. Lastly, before we begin, I invite you to place three ingredients into your heart. These are: Acceptance, Love, and Courage. Acceptance will help balance your judgment, Love will manage your fear, and Courage will help soothe your anxiety.